Furthermore; after extensive reviewing the GDPR we conclude that we are still comfortable collecting Device-ID’s and/or placing Cookies. Possibly more important; we are still (very) comfortable serving ads based on GPS coordinates AS LONG as the app in question informs their downloaders/users that GPS coordinates are collected. Besides creating this addendum, we have found a way to map all apps that properly inform their downloaders/users about the commercial use of lat/long coordinates - which is in compliance with GDPR protocol. Heatmaps of impressions, clicks and many more metrics! We all like heatmaps. They visualize - in this case - the results of your campaigns. 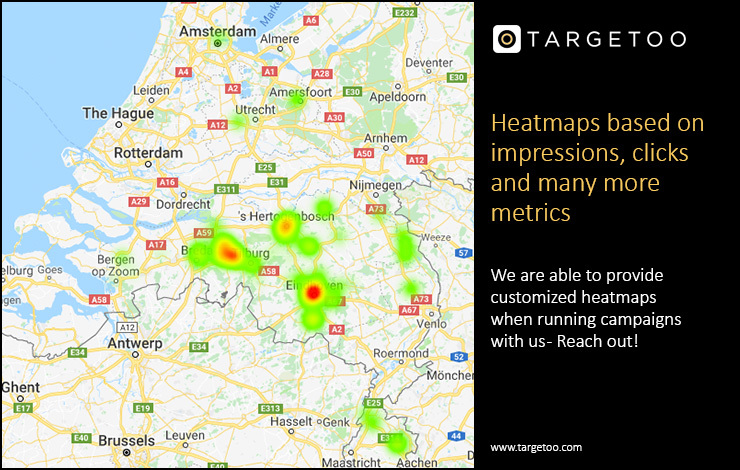 Running campaigns with Targetoo means you can create/receive heatmaps for any of your past or present campaigns. Whether is impressions, clicks, view-through-rate, conversions or any other metric you can think of; it's possible to export this data on to a heatmap. Reach out for questions/inquires. Upload up to 1.000.000 addresses and serve on these exact locations! Uploading locations/addresses in a Demand Side Platform and serving on these exact locations - using geo-fences - is getting more popular by the day. This technique allows you to reach specific audiences in an unraveled way. Forget using third-party-data and IAB categories to reach a desirable audience/target group. Upload addresses/locations where your desired audience is to be found, and achieve strong campaign results. Reaching a specific audience using this targeting technique is proven to be strong/stable and usually has a positive ROI. As a Location Based Advertising specialist we have invested a great deal in our geo-tool. By our knowledge, we operate the only DSP that is able to upload an indefinte amount of locations - while remaining stable. Reach out! Many businesses these days are finding the need to advertise their products through the programmatic advertising world. Retargeting and Remarketing campaigns are considered strong and usually have a positive ROI. In this whitepaper we discover and explain some ‘advanced’ Retargeting and Remarketing strategies. For example, it is not a secret that you can easily create a Facebook account, a Facebook company page and in no time you can have a ‘social’ programmatic campaign up and running with Facebooks’ Ads Manager. However, because the CPM’s for Facebook inventory are relatively high, we outline and explain techniques that allow you to make the most of your budget using a much more clever approach. There are a many ways in which advertisers can boost the performance of their campaigns. Particularly, this article outlines those related to Retargeting (impact users that have interacted with a programmatic campaign by either clicking in the ad or just seeing it) and Remarketing (impact users that have visited a specific website whose ID has been gathered - for example - by using an html tag). So what are the most Popular apps – worldwide? When operating a Demand Side Platform that is integrated with the most substantial inventory sources (adexchanges), It’s possible to do some forecasting regarding apps that have the largest volume. Or; the largest amount of visitors. Noticing something? Not the most established brands are in this list right? Where’s CNN? Or Gmail, BBC and The New York Times? Not in there! It seems that publishers providing practical necessities, are way more popular than established brands. Go ahead and compare a countries’ most popular news app, based on availability availability (in terms of impressions), to practical apps that everybody needs. Even on a national level – in most cases – practical apps like Clean Master (tool for 'cleaning' your phone), Grindr (gay dating) or Goal Live Scores (soccer statistics/scores), have a bigger audience that that countries’ most well-known news publisher. Rather pleasantly; advertising in these apps is relatively cheap. Mainly because advertisers (or; brands), don’t like these generic apps. They don’t like the apparent less qualitative image that these apps have. In our opinion, the fact that advertising in these apps is usually cheaper than in – let’s say – an established news publisher, is all you need to know. Users of these practical apps are real persons. Real consumers. There is no reason to assume you will reach a less profitable audience. Especially if you combine serving on these apps with 3rd party data (f.e. Interest profiles of the user behind a certain devices); a lot can be achieved. With the programmatic industry spreading at the current rate more and more methods for preventing fraud are emerging. One of the major concerns is the quality of the impressions served. Although a DSP may show that an impression has been made on a certain inventory, this may not be entirely true. The key aspect is to ask ourselves: how are those impressions being counted? The truth is that if your DSP is connected to AdExchanges most probably these are being tallied with the rules of those AdExchanges. For instance, some might count the impression when the RTB auction is won (like Axonix), others might count it once the actual advertising space has been filled by an ad (like Mopub), etc. This means that the quality of the impressions is not guaranteed because the user might leave the page or app just after the auction has been won and, even though your DSP has counted an impression, the user has not seen the ad you paid for. This means that any click (or any possible action down the funnel) couldn’t be possibly achieved and, therefore, no branding impact or lead generation is viable. Shouldn’t there be a way to know when this is happening? Fortunately for the programmatic market, there is. A special pixel has been developed by third party companies (e.g. Google or Integral Ad Science) that successfully collects information about the viewability of a certain ad. The viewability pixel is a tag of code that aims to track when an ad has actually been on the screen of a device. In order for an ad to be considered as “viewed” it must be at least 50% visible on the screen for more than 1 second (for video ads the required time is increased to 2 seconds). When these conditions are met, the pixel fires and passes back the information that the ad space has indeed been seen by the user. For example, take an ad space located at the bottom of the page. When the page loads, the AdExchange starts the auction and at some point between winning the action and filling the space, an impression is counted. However, if the user has not scrolled down to the page the ad is not deemed viewable and, therefore, useless. According to a recent study around 52% of display ads and 41.7% of video ads are out of view. This means that a significantly large number of impressions is being wasted. But instead of knowing that the impression was not worth it after buying it, why not make a system that prevents useless impressions? The Pre-bid solution is an industry best practice that’s now widely accepted. A third party vendor makes sure that a particular ad is seen or placed in a safe environment and meeting certain conditions. In order for this to work the viewability metric has been created. The viewability pixel, as opposed to the impression pixel, is embedded in the ad space and not in the ad that is actually filling it. So this means that the pixel is fired once the ad space appears on a screen, regardless of what is showing. This metric gives the percentage of the amount of times that the ad has been visible. For example, if since the pixel was first installed the page has loaded 10 times and the ad space has been on a device’s screen 5 times, the viewability threshold for that impression is 50%. An important point to note is that the benefits of pre-bid functionalities are maximized when combined with programmatic advertising. Real-time decision-making allows the traffic to be of a much higher quality when this two tools are combined. Furthermore, placements are more transparent which means that the performance of the campaigns rises and also the efficiency and effectiveness with which the algorithm operates. Given the current industry concerns about viewability, brand safety and fraud, pre-bid provides a level of guarantee about ad placements. Ad spaces are only bid on and served in if the ad inventory meets the specific conditions set by the advertisers in the pre-bid filtering. The DSPs that are integrated with these functionalities offer different options to customize the kind of publishers that advertisers want to bid on. They must specify these pre-bid requirements upfront: desired viewability thresholds (up to 70%), brand safety exclusions, suspicious activity levels or contextual targeting (what information is surrounding the ad space). Some of these filters can even be combined together such as viewability and brand safety. One of the recognized downsides and trade-offs that advertisers need to make when considering using pre-bid is the impact on campaign delivery. This trade-off can be managed by changing thresholds such as viewability levels. Another point to note is that there are limitations with pre-bid and in-app advertising; the in-app versus mobile web pre-bid options are visible in the platform and advertisers. At Targetoo we always aim to deliver the best and most complete solutions to every client. That is why we have teamed up with Integral Ad Science to offer this Pre-bid solution. It is available in our platform and ready to start delivering impressions with the highest quality. Due to our fiduciary commitment, we are always looking for ways to bring better experiences to our clients. That is why we are keen to show you this new feature! Just reach out to us and we will gladly walk you through the platform and answer all the questions that come up. According to Google’s Active View and Integral Ad Science (IAS) guidelines. Since the pixel is tracking how the ad space is behaving, it can help detect suspicious activity. Such as phantom clicks (when no impression has been made), click spamming (more than one click per impression), etc. Geofencing has become one of the most powerful tools of mobile advertising and can be used in a number of ways to ensure your company can generate revenue in specific areas. For a lot of companies, their ideal customers and clients are located in particular locations at certain times, i.e. Starbucks customers are located in shopping complexes at lunchtime. By using geofencing effectively, these customers can be targeted. However, driving foot traffic is just one of the ways that geofencing can be put to good use. It also has a number of capabilities and uses, many of which we will explore below. So, if you want to learn more about geofencing and how businesses around the world have been using it, read on! Geofencing is a technology that allows us to create a virtual boundary around a particular geographic area. After this, devices are triggered once they enter this area and sent an alert. There are both active and passive types of geofencing. To better understand geofencing and its benefits, below we’ve come up with a few examples of how companies have used it to create brilliant results! The customers of your competitors provide an opportunity. While they are currently loyal to one of your rivals, you’re also certain they have an interest in the service you provide. At which point, the only action that needs to take place is that they decide to start using your service or product instead of your rivals. Easier said than done, yes, but Outback Steakhouse was able to successfully do this, by setting up geofencing near their competitors outlets. That meant, every time their ideal customers were going to their competitors, they were provided with advertising that constantly reminded them of their outlet as the alternative. To solidify this strategy, Outback Steakhouse set up geofencing around their own outlets to protect their existing customers. Best Western is a company that runs a chain of hotels across the globe. Because of this, their main goal is to ensure they get as many people filling their rooms as possible every night. By setting up geofencing around airports, Best Western advertised to those people who were arriving in a particular region where rooms were available. This campaign was started after data showed many people who arrive at airports still haven’t booked somewhere to stay and, through this, was able to clinch last-minute customers. Currently, Uber is the dominant company in the car transportation market, using their application to find and hail a ride near them. As with any taxi company, airports are a hotspot for Uber and, because of this, Uber set up a geofence to protect their dominance near LAX airport. Through this, they prevented the growing number of smaller, copycat companies that were aiming to encroach on their territory and held on to their market dominance. For companies looking to defend against new competitors, geofencing is a great way to ensure you can protect yourself from losing competitors. The British Open Golf Championships attracts one of the largest collection of golf fans every year and, once they’ve bought their ticket, organisers are keen to ensure they stick around and spend additional money. To help them with this, The British Open set up geofencing around the entire course and allowed spectators to track every player and see how well they were performing throughout the tournament. This provided a nice little perk that many people attending the event took advantage of and will likely be a way to persuade a number of them to return to the next event. A lot of the time, vouchers are location-specific and, because of this, geofencing becomes an extremely effective way for them to be advertised. Vouchercloud used geofencing to send alerts to those that were close to shops they currently had vouchers available for. This allowed them to find their discount straight away as they headed to the shop. This was both great for customers and Vouchercloud and has helped them to drive a large amount of relevant traffic to their website. As the examples above show, geofencing and location-based advertising, in general, has had a large impact on how many businesses advertise. It has provided a new and effective way to attract new customers in a manner that’s direct, relevant and difficult to ignore. That’s not the sort of thing that can just be dismissed if you’re interested in growing your business and moving with the times! It’s not always simple, though. Geofencing is only effective when it has been planned out correctly with a clear strategy. Agencies and advertisers like simplicity. They like to pay a fixed fee for a conversion. Either doing performance based advertising on desktop/laptop, tablet or mobile inventory; it’s all about that fixed fee (stimulated by the well know last click attribution model). Isn’t the customer journey more complex than clicking on a banner and buying a product? Of course it is. Marketers like the word ‘touchpoint’ for a reason; there are many points a consumer touches before committing to an online or offline purchase. A touchpoint can be a TV commercial, a friend with a recommendation, an Out-Of-Home ad, an ad in print or; a display banner on a mobile device or computer. It’s that first touch that implants a desire to purchase/own a product. It’s a hot topic. Mobile will be – or already is – the biggest channel for online purchases. A significant amount of research suggests that various countries have passed the tipping point of having more online purchases via mobile devices compared to desktop and tablet. While a couple of years ago researchers concluded that the mobile device is mainly used for product orientation; today, the majority of actual purchases are being performed on mobile devices. Secondarily there is the fact that apps play a huge role in today’s shopping behaviour. Brands have their own apps, online shops have their own apps and in many cases a product is simply an app. In this whitepaper we explore the status quo concerning Performance Based Advertising within the mobile channel. Clothes, groceries, electrical equipment, sport related products, health products, travel or finance products; it doesn’t matter what the product is, theoretically it can be bought using a mobile device. Just like almost every product can be bought online using a desktop, laptop or tablet. The purchases (or; conversions) can be stimulated by different online marketing tools. Performance Based Advertising means that a tech vendor (of a certain marketing tool) will only get paid a fixed amount for every conversion that is achieved. With this, the risk for the product owner (or; shop) is practically zero. How big is the threat of the digital advertising market being swallowed by Google and Facebook? Everybody in digital marketing has heard - or participated in - a discussion about Google and Facebook swallowing the Programmatic Advertising sector. Facebook has it’s obvious own/exclusive inventory and Google's Double Click Bid Manager (DBM) tries to offer the greatest amount of inventory by simply integrating with a lot of available inventory sources (a recent integration with Out Of Home Programmatic supplier is a perfect example of this strategy). So; as an owner of a Programmatic Advertising company I ask myself, are we in danger? Will big media agencies (our clients) – when it comes to programmatic advertising – only deal with Google and Facebook in, let’s say, 10 years? Our professional perspective? No. We (Targetoo) work for several media agencies around the world. Often we get the question; what is your added value in comparison to Google’s Double Click Bid Manager (DBM)? It’s a relevant question. In some cases, we can not offer added value (apart from delivering services through DBM for a client who wishes to use DBM – utilizing our knowledge). Over the years Google's Programmatic Advertising Infrastructure has initiated and completed a lot of integrations with well-known inventory and data sources (Adexchanges/SSP's/DMP's). As of today, I can acknowledge the fact that – when it comes to the amount of global inventory – Google is getting ahead. Facebook is a different story. We know media agencies who have shifted their programmatic buying almost entirely to Facebook's Ads Manager. It appears a logical choice because everybody is one Facebook right? Well, not entirely. For starters; although results of research differ, it’s fair to state that, globally, on average, a person spends 22 minutes on Facebook per day. Other research shows that, on average, a person spends 118 minutes a day online. Furthermore, 81% of this time is spent on a mobile device and only 19% on a desktop or laptop. This means that, although time spent on Facebook is far bigger than any other publisher (youtube comes second), it’s still not even near the time spent on all other publishers. And here’s the thing, more people access the ‘general’ internet (and it’s publishers) than they do Facebook. The point is that, although Facebook is immensely important in day-to-day online marketing, the reach a strong Demand Side Platform (DSP) can offer is still much larger and more diverse. Secondarily it’s worth mentioning that average CPM’s are relatively high for Facebook inventory. Because of this, we see that allocating large amounts of the client's budget to social, is not the way to go. It’s quantity and targeting options definitely make it an essential online marketing tool to have in your programmatic display arsenal. But available impressions in/on all other publishers (general internet) are inherently cheaper and available in much bigger numbers (although some might say you can't compare the two). So in summary; pricing for Facebook Advertising is relatively high and reach is limited (how immense it may be). Back to Google; with DBM you can serve ads on hundreds of thousands of apps and websites (desktop or mobile). One might say that by using Googles’ DBM and Facebooks' Ads Manager, you can reach the biggest part of the world’s inventory. This is correct. However, and here it is, the success of a programmatic display advertising campaign most often lies in local expertise and campaign execution based on that expertise. Also, DBM does not allow geo-fences to be smaller than 1 mile. A dedicated Mobile DSP does (as small as 10 meters). The success of a programmatic display advertising campaign most often lies in local expertise and campaign execution based on that expertise. Local integrations with local inventory sources. Local (premium) publishers. Local advertising laws. Brand safety. The speed of service. General knowledge. Either using DBM or another Programmatic Buying Platforms; local knowledge is key. And being that local integrations (Adexchanges/SSP's/DMP's) are not something Google is in front of, a local specialist can jump in this gap by offering smart, fast and simple integration services. Campaign objectives are so diverse that there is no ‘one’ platform that suits all desires. There will probably never be one, and there will always be room for the specialized companies that focus on a specific discipline, a local market or just have outstanding service. So to all the small tech vendors that are out there and feeling the heat of Facebook and Google, I say this: Facebook only sells/distributes its own inventory. Although this inventory is huge, it’s still just Facebook inventory, let alone it’s very pricey. Google can never offer better local expertise and tech than existing specialists can. Campaign strategies are different for every client/brand, every location has it’s own technical- and campaign possibilities. There will always be room for the fast moving, smart operating, (relatively) small Programmatic Specialists. Simply because successful campaigns need them. Moment Marketing, what is it? In a world of ever-changing marketing trends, one of the most exciting and interesting developments is in moment marketing. If you’re currently unaware of what this is or are interested in solidifying your knowledge, this article will explain all of the most important details. As well as this, we’ll be covering how it can be used specifically with mobile advertising as well as some specific examples for you to examine. Without further ado, let’s find out more about moment marketing. Moment marketing is a relatively recent development that has only been around for the last few years. However, despite how young it is, it’s grown rapidly, thanks in part to the rising usage of social media. In essence, moment marketing is the method of using a recent event to your advantage and turning it into an advertising opportunity. This may include everything from a large sporting event to a concert and allows companies to create relevant, targeted interactions with consumers. Because of this, moment marketing is sometimes referred to as “real-time marketing” and, due to the nature of the strategy, requires rapid reaction and efficiency to be effective. The best way to explain moment marketing is by looking at it in action. This will show some great examples of how live events can be turned into an advertising opportunity. In April 2017, United Airlines made headlines for all of the wrong reasons when Dr David Dao was dragged off an overbooked plane. To rub salt into the wounds even further, competitor Emirates Airline reacted brilliantly by quickly posting a video on Twitter with the ending caption ‘Fly the friendly skies...This time for real’. This tweet eventually got well over 10,000 retweets and 15,000 likes, which is some serious engagement. Every four years, the football world cup takes place and attracts audiences, which have risen as high as 260 million. As a result, marketing teams are keener than ever to capitalise on this to increase brand awareness. In the 2014 World Cup in Brazil, audiences were amazed as Uruguayan star, Luis Suárez, was seen to bite Italian defender Giorgio Chiellini. The moment soon went viral and was spread widely throughout social media. Still one of the best examples of moment marketing to this day. It has received over 44,000 retweets and 20,000 likes. Steve Harvey became infamous in December 2015 when he announced the wrong contestant as the winner of the Miss Universe Content. This led to an awkward moment as the crown was taken away and, instead, placed on the correct contestant. Twitter went mad, with the advert eventually gaining just under 50,000 retweets and 45,000 likes. How can you use Moment Marketing? As the examples show, moment marketing, when done right, can provide a massive boost to your awareness online. So, how can you start to implement this as a strategy for your company? Well, firstly, these the three examples of moment marketing demonstrate social media’s ability to allow content to go viral. This puts forward a strong indicator that, when a moment like this takes place, social media advertising is one of your best bets to distribute your viral-worthy content. This can include both the use of organic advertising and, if you’re determined to increase reach and the potential for it to go viral, paid advertising. In regards to how this relates to mobile advertising in particular, mobile is perhaps the reason this strategy is even effective at all. As a large event takes place on TV or at an event, be that a bite or a Miss Universe blunder, the first action a large percentage of audiences do is to look for reactions as well as to post their own. In almost all cases, this will be done on the device closest to them - their mobile device. This, in turn, creates a spike of social media activity that can be utilised for your own marketing purposes. With this strategy, the most important element is the speed in which you can react. With the immediacy of social media, even an hour of delay can put you at the back of a long line of marketing opportunists. As well as this, you also need to focus on the relevance of your brand and the effectiveness of the advert. If your marketing team isn’t able to come up with something within a few minutes that resonates with your audience or your brand, it’s likely there isn’t something there to work with. With all our examples, advertisers had direct relations with the event be that Snickers age-old marketing related to hunger and aggression or Emirates Airline’s link with United Airlines. If your brand doesn’t have that, you can’t create one without it coming across as just a little bit awkward. But, when a lightbulb hits and you’ve got an opportunity for your brand act fast, create something effective and utilise social media to distribute your content and hope for it to go viral. If you’re really looking to make Moment Marketing a part of your advertising repertoire, a great place to boost your efforts is by utilising mobile display ads. The example below is from Norwegian Airlines. Using the celebrity news of Brad Pitt and Angelina Jolie’s divorce, NA made the most of the opportunity to advertise the cost of their flights from the UK to LA. This advert was shared not just on social media, but also on numerous websites and, most importantly, on a number of mobile apps and browsers. As is Moment Marketing’s requirement for speed, this would have only been possible due to the fact programmatic can have an ad live in relevant areas within minutes. This extra layer of attention created a much larger reach than social media alone could have achieved and helped bring the company out of obscurity in the UK and into the public eye. If you’re looking for extra advice and tips on moment marketing, Targetoo are experts in the field. To find out more, go to our contact page. For the experts this is nothing new, however for many other online marketers it is; clever applications provided by programmatic mobile advertising. What is possible and what to expect in terms of results? Programmatic mobile advertising has many applications and offers a large amount of possibilities in terms of campaigns and strategy. Nevertheless, the marketing discipline is limited to display advertising, nothing more and nothing less. But is this still the case in 2017? Versatile DSP’s (Demand Side Platforms), whether based on a self-serve or managed service, offers the possibility to upload device ID’s and serve ads on relevant devices. Let’s take one step back: a device ID can be seen as a digital signature of an individual device or in other words, a consumer. These device ID’s can be observed and saved by beacons and WIFI hotspots. For example, by beacons in a retailer store or by WIFI hotspots of a university or restaurant. These device ID’s can then be uploaded into a DSP (Demand Side Platform). This enables ads to be served on the devices in question once a website or app is visited that the DSP can serve on – f.e. The Telegraph, BBC or The Guardian - (the use of a DSP, connected to many ad-exchanges is a must). The new location of the user ID is not limiting. Regardless of whether the device is in Asia, Canada or simply in The UK; if the device ID is collected in the McDonalds on the M5 an ad can be served (for example, with the address of the nearest McDonald’s in Canada). This simple application of technology has the power to convince advertisers/clients instantly. For almost every interest, hobby and situation an app or mobile web has been created. This generates opportunities that few agencies / advertisers – as of yet – embrace. Let’s take one step back again; a DSP (Demand Side Platform) can serve ads on roughly 200.000 individual apps and mobile sites. This ranges from upmost popular and well-known applications to somewhat more specific and relatively unknown applications. There are apps available for hairdressers, handymen, painters, art lovers, food fanatics, sports (-with all its subdivisions), furnishing, horse lovers, travel, gardening, children’s education, scuba diving, the moon and so on. This means that not only for brands in general - whitelists can be used, but also for specific products. If an advertiser wants to bring a new knife-set to the attention, it’s possible to serve ads in roughly 50 cooking-related applications and mobile sites. When an advertiser would like to bring healthcare to the attention of a relatively healthy group (with all its advantages), it’s possible to serve ads in about 150 sport and activity applications. If an advertiser would like to bring an insurance for water sports to the attention… you can feel it coming; it’s possible to serve ads in roughly 65 specific water sports related apps. Anyway, whitelisting; a well-known application of programmatic mobile advertising, but with the growth of it’s technology and reach; now more versatile and for practical use than ever. Reaching audiences through serving ads on specific locations is nothing new. This technique has been around for years. Nevertheless, also for this discipline it applies that with the growth of the overall market, the applications really come to life. Especially when a Demand Side Platform invests for years in connecting to dozens of mobile ad-exchanges / sources, a huge reach on hyperlocal scale to effect. A good DSP is connected to more than 30 adexchanges reaching f.e. The Telegraph, BBC and Youtube to Wordfeud and back to Spotify; almost all applications and mobile sites which allow ads, can be involved in a certain campaign. Why is this so important? If a client or advertiser wants to reach IT specialists, a good DSP offers to upload dozens of addresses from IT related companies (these addresses are relatively easy accessible). Next, when a device (or consumer) visits an application or mobile site that the DSP can serve on – while he or she is in a specific location (for example in the office of an IT company) – ads can be served. The essence remains that through the possibility of reaching thousands of applications and mobiles sites – on a hyperlocal scale – a necessary volume for a successful campaign is realized. Advanced platforms are able to upload more than 10.000 locations, creating huge amounts of traction. We see the industry growing up. We see campaign options that are popular and widely used. Nevertheless, we are seeing less common campaign options gaining popularity fast. Simply because anno 2017 - the years of technological consolidation and hundred of thousands of publishers getting themselves reachable within the programmatic landscape – is finally paying off.